Four world premiere recordings of pieces written for Yesaroun’. Daydream was originally intended to be one movement from a suite for sax and percussion that was to be called A Day in the Life. The idea for the suite was to take various words that could be associated with everyday activities in life: Go, Eat, Sleep, Daydream, Flirt, etc., and find a way to represent them musically. However, I started with Daydream and it took on a life of its own, separating itself from the suite idea. The texture of the work is imitative of a dream, no real linear development, presented in a soft cloud of patches here and there to be sewn together by the dreamer upon waking. When we dream, we perceive things in fragmentary chunks, and when we awake we derive some sort of meaning from them, The meaning can be specific or ambiguous, and often presents itself on many different levels. The recorded material consists of speech material which has been processed to create harmonic pitches, which then provides the harmonic material for the vibraphone. The rest of the pitch material is almost entirely derived from the hymn We Shall Overcome. While the piece is, on one level, a reflection on the struggles and achievements of the civil rights movement, that is only one of many possible interpretations. Keeping in line with the original idea, Daydream will hopefully infuse a sense of hope and comfort on top of whatever meaning you happen to derive from the work. Daydream is dedicated to my brother and sisters, Casey, Chelsea and Tiffany. +8 takes its title from the legendary Detroit techno label of the same name. Founded in 1990 by Richie Hawtin and John Aquaviva, the record label took its name from the pitch adjustment function available on professional DJ turntables, which allows tracks to be spun at up to eight percent above their original tempo. My piece attempts to mirror both the specific effect of controlled changes in tempo and the broader effect and influence of Detroit techno on my music. Snapdragon was written for and premiered by the Yesaroun’ Duo with their fearsome exuberance and technical virtuosity in mind. The piece was composed during a time of media frenzy over America’s initial attack on Iraq. Snow was falling in Princeton, physically trapping me in a tall apartment, while my connection with the outside world at the time – the TV – projected sensational stories and graphic images of far away places in turmoil. Gradually, I had this sense of becoming numb, as weather and war preyed on a creeping awareness of my incapacity to act in any tangible way. So, the music that emerged has a certain physicality, borne of frustration and a sense of disenfranchisement: it is music rooted in the body, and composed for the body – dance-like, of heartbeat, breath, and sigh – a way to “voice” when I couldn’t speak. 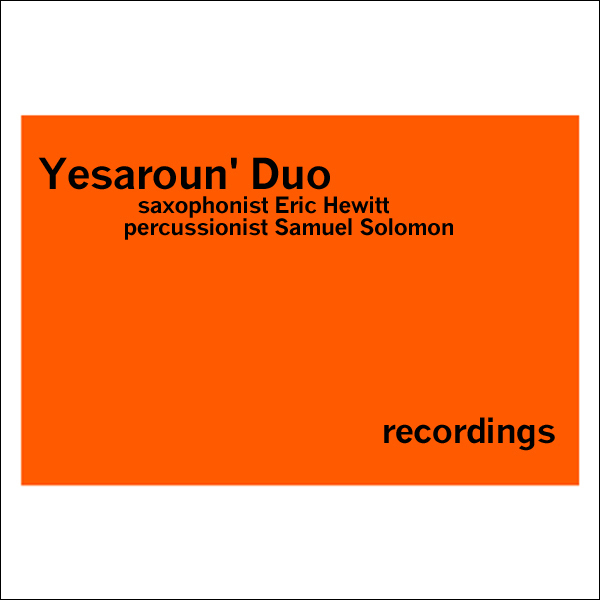 Time After Time was written for the Yesaroun’ Duo and marimbist Nancy Zeltsman. I set out to write a piece that was primarily fun to play but rhythmically challenging enough for two percussionist and one honorary percussionist to play. The title refers to the fact that all the material recycles itself at different speeds. The marimba’s long, quasi-chorale lines proceed, initially, without noticing the rhythmic shifts and upheaval below. Halfway through the piece, a jagged marimba solo features the instrument’s precise, dance-like qualities, and after being joined by the saxophone and percussion, propels the whole ensemble towards the rhythmic and harmonic excesses of the final section.